The V&A in South Kensington, London, has a superb furniture collection with examples from all eras, including a particularly good contemporary furniture collection. If you are interested in furniture design or just want to get some ideas for a piece of bespoke furniture that you want to commission, then it's well worth a visit. Staying in London, the Geffrye Museum, in Shoreditch, has an excellent collection of furniture from 1600 to 1950's, in a series of period rooms which carefully re-create the interiors of the times. In the Cotswolds, the Arts and Crafts Museum of Cheltenham Art Gallery & Museum has a fine collection relating to the arts and crafts movement, which includes furniture, pottery, silver, metalwork, jewellery, textiles and embroideries. For those in the North, the Bowes Museum, in Barnard Castle, County Durham, has a comprehensive collection of European furniture between 100 and 400 years old, displayed in fine period rooms. If you are considering training as a cabinet maker or furniture designer here are a few sites that may be of interest. 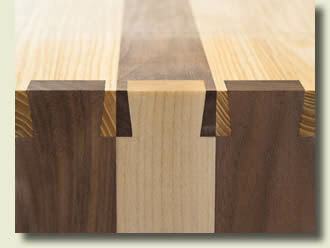 Rycotewood College has trained many UK cabinet makers - including myself. Now part of Oxford and Cherwell Valley College, the rebranded Rycotewood Furniture Centre continues to offer a range of furniture related courses. For those that are looking for a degree level course, whatuni.com lists these Furniture Design degree courses - a total of twelve universities offering courses currently. Bucks New University runs a range of furniture and design related courses, including a Furniture Studies HND, as well as degree level and postgraduate (MA) courses. If you are looking for practical, vocational courses in furniture related subjects, then the City and Guilds website can give you all the information you need, including details of your nearest training centres. Outside of the academic and vocational institutions, there are a number of cabinet makers that independently provide private, predominately workshop based training. Amongst these are: David Savage - in North Devon, David Charlesworth - also in North Devon, Chris Faulkner - in South Devon, The Chippendale International School of Furniture - in East Lothian, Scotland, and Michael Scott - also in Devon. Caroline provides personal, unique and functional glazing solutions, individually designed and created to add a stunning artistic statement to any space. If you are looking for books on Cabinet Making and Furniture design, whether you intend to persue it as a hobby or a career, here are some recommendations. The links will take you to the relevant page in Amazon UK for that book. This is a thorough introduction to furniture construction and cabinet making, covering everything from design and wood selection to construction and finishing. Sometimes referred to as the furniture maker's Bible, this is the reference text for many UK furniture courses. If you can buy just one book on cabinet making - this is the one to get! This book by Klaus-Jurgen Sembach is a good review of the history of modern furniture design. It includes works by Henry van de Velde, Charles Rennie Mackintosh, Josef Hoffmann, Le Corbusier and Philippe Starck. Robert Wearing, author of this book and of The Essential Woodworker , is a long established teacher of woodworking who writes from a wealth of practical experience. If you want to search in Google for nearby services then try searching for the thing you are looking for, along with your postcode (or part of your postcode) - e.g. furniture SW6. Google will return pages containing 'furniture' that also contain the postcode SW6. That's why you see our address at the bottom of every page! If you want to combine a phrase with a location, then it is best to enclose that phrase in quotation marks - e.g. "cabinet maker" SW6. A directory of UK retailers, including clothing shops, home improvements, holidays, cars & insurance. A categorized UK business directory and search engine. A UK directory for all things to do with renovating, decorating, designing and furnishing your home. You should be able to find a local directory for your area by doing a search for 'mytown directory' in Google or any of the search engines.